The real tribute to Patel would be to carry out large-scale structural reforms in agri-markets to ensure that a higher percentage of the consumer’s rupee goes to farmers. On October 31, Prime Minister Narendra Modi will unveil the world’s tallest statue, the “Statue of Unity,” in the memory of Sardar Vallabhbhai Patel. One may recall that when Modi started his campaign for the 2014 general elections, he appealed to farmers to donate their used farm implements for the construction of this statue that would remind the country about the role played by Sardar Patel in not only unifying a divided country but also his devotion to the cause of farmers. Some Opposition leaders have criticised the project on the ground that the statue uses imported Chinese bronze, and not iron from farmers’ used instruments. We do not touch upon that controversy, but want to focus on Patel’s message on agriculture. If the Modi government heeds that message, it will be offering a real tribute to the Sardar. It would be interesting to recollect Patel’s contribution to Indian dairy farmers. In 1942, safety concerns drove the colonial government to tap a private dairy, Polson, in order to procure milk from Kaira district in Gujarat and supply it to Bombay, some 350 km away, where the Britishers were stationed. This marked the beginning of the government’s Bombay Milk Scheme (BMS) and the creation of a market for Kaira’s milk producers. But this established Polson’s monopoly over the Bombay market, as a seller. Polson also became a monopsony, as a buyer from Kaira farmers. As a monopolist and monopsonist, the company extracted large rents by squeezing the prices it offered the farmers, who approached Sardar Patel for help. Patel urged them to organise cooperatives and cut supplies to Polson. He asked his deputy, Morarji Desai, who, in turn, asked Tribhuvandas Patel, to carry the struggle forward. In 1945, agitated farmers held a 15-day strike against BMS. They spilled milk on the streets, instead of supplying it to Polson. This broke Polson’s monopsony. The Bombay market was opened for direct supply of milk from Kaira farmers. This access to a lucrative market incentivised farmers, and they formed the first farmers’ integrated dairy cooperative — the Kaira District Co-operative Milk Producers’ Union, which was registered in 1946. Verghese Kurien, the father of the White Revolution, joined the cooperative as a general manager and set up the first processing plant at Anand to convert excess buffalo milk into milk powder and cheese — a technological wonder at that time. On Patel’s birth anniversary in 1964, the then Prime Minister Lal Bahadur Shastri was invited to inaugurate Gujarat’s first cattle-feed compounding factory. He reached Anand a day before the event and spent the night among villagers. Impressed by the district’s transformation, he urged Kurien to spread the message of Kaira’s business model across India. As a result, the architecture of “Operation Flood” was laid down, and a new institution, the National Dairy Development Board (NDDB), was formed on July 16, 1965, with Kurien as its chairman. Kurien spearheaded the operation by compressing the value chain and scaling-up vertical coordination between farmers, processors and consumers through cooperatives. He mobilised funds through sale proceeds of skimmed milk powder and butter donated by the European Economic Commission, loans from the World Bank, and subsidies from the government and invested them in strengthening the dairy value chain. As a result, cooperatives, especially in Gujarat, managed to ensure the highest share of the consumer’s rupee (75-80 per cent) to the farmers. 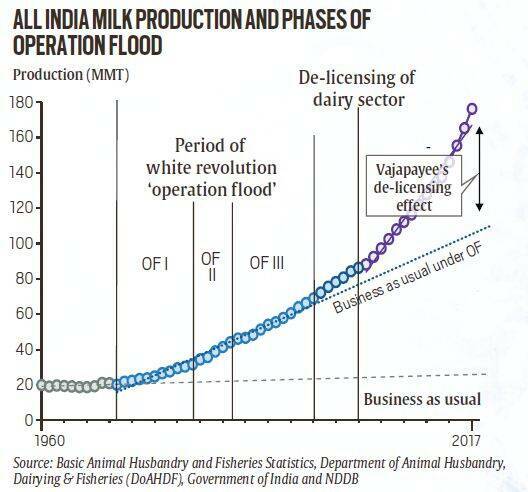 Operation Flood (1970-96) has had a significant impact on milk production. It rose from 20 MMT in 1970-71 to 31.6 MMT in 1980-81 to 44 MMT in 1985-86 and 69.1 MMT in 1995-96 — a jump of nearly 50 MMT in 25 years (see figure). 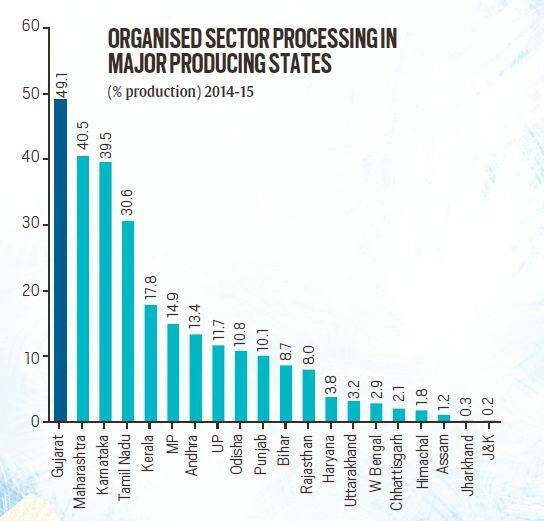 As Kurien would often say, organising farmers was an easy task, but accessing lucrative markets was a challenge. As production expanded, Kaira farmers tapped markets as far as Calcutta. The milk travelled 2,000 km by rail on specially-designed tankers. But despite the success of Operation Flood, less than 10 per cent of the total milk production was being processed through cooperatives. The success of milk cooperative remained largely confined to Gujarat, despite the preference given to cooperatives in allocating licences for dairy processing plants. It was only in 2002 that the dairy sector was fully de-licenced by the Atal Bihari Vajpayee government. This created competition and the processing capacity created by the private sector outstripped the cooperative’s capacity. However, the organised cooperatives and private sector are still processing less than a quarter of milk production in India. India is now the world’s largest milk producer — 176.4 MMT in 2017-18, leaving the US (98 MMT) and China (45 MMT) far behind. However, food safety concerns with regard to milk remain. Today, the farmers have to suffer low prices of farm produce, ranging from milk to pulses and oilseeds and cotton. The Modi government has announced minimum support prices (MSPs) based on a formula that gives at least 50 per cent margin over Cost A2+FL. But unfortunately, market prices remain 10 to 50 per cent below these MSPs. The real tribute to Patel would be to carry out large-scale structural reforms in agri-markets that can ensure a higher percentage of the consumer’s rupee going to farmers, be it through cooperatives, or any other marketing channel. If the Modi government can effect this reform, it would have paid a real tribute to Sardar Patel from the farmers’ standpoint.